I’ve been writing on my blog, pretty much every week, for the last five years or so. There are 446 posts here now which, at a highly conservative estimate of 600 words per post, is, well, quite a lot of words. On almost all of these posts, there is one constant. One very welcome constant. It’s that man at the end of the post who comes and offers a comment, usually his thoughts as evoked by the post. This man is Jim Murdoch and this post is about his comments on my blog. Jim and I are friends, although we’ve never actually met or even spoken aloud to each other. We are friends through Social Media, primarily through our blog comments and a couple of other related external dealings. Jim doesn’t have to come and plant his thoughts on my blog posts every week. He has many better things he could be doing. He is, to my mind, an exceptional poet and writer. He is many things; stalwart, intelligent, funny, and consistent and, when he reviews a book, it stays reviewed. His own blog ‘The Truth About Lies’ is a testament to his depth, his perception and his depth-perception. Jim has written and published novels, short stories, poetry collections. I reviewed his first published novel ‘Living With the Truth’ here some years ago. A subsequent novel, ‘Milligan and Murphy’ is perhaps my favourite. It evokes Jim’s much-admired Samuel Beckett in a striking way whilst also retaining the humour and aptness which invariably colours his own work. I find it rather hard to pin Jim’s writing down. If I had to, I think I would refer to it as ‘refreshingly old school’. Jim’s writing evokes, for me at least, a more solid time. A time of Alan Sillitoe, Morecambe and Wise, Keith Waterhouse, Samuel Beckett. Jim does ‘funny’, ‘real’, light and dark in equal measure but what he does most is hinted at in the title of his blog. He does Truth. When reading Jim’s stuff, I so-often find myself saying things like ‘I’ve felt that’, ‘He’s right there’, ‘That is so true’. Jim does truth in spades and it’s a great trick to be able to pull off. He has a new collection of short stories out and I would recommend it to you. It’s called ‘Making Sense’ and you can get a copy by clicking here if you like. The pieces in it are quite short and many of them punch above their weight. I think it’s an excellent guide into the urban pathways and wooded trails which Jim explores. I value Jim’s comments on my posts very highly indeed. His insights frequently compliment or counterpoint whatever I am trying to express in a particular post. Often he succeeds striking the very note which I had been striving for. I also believe that, by taking the trouble to turn up, he is subtly encouraging me to continue, that he is expressing a little faith in whatever level of talent I might have. I think he believes in my a wee bit. But there is another value to Jim’s comments. More than anything, Jim’s comments make me feel like a curator of something quite valuable. On his own blog, Jim concerns himself with higher issues of poetry and literary review and such. Elements of himself seem only to creep in by osmosis. Here on my own blog, where I try to write as openly as I can about whatever trivia is currently exercising my brain, Jim seems to pay me the compliment of doing the same thing. His replies to my posts are often in-depth, personal, self-revelatory and unerringly consistent and honest. Increasingly, I feel that these comments which Jim leaves me have a value which is quite beyond the value of a regular comment or series of comments. Taken together, I think that Jim’s comments build to a picture of the man which might surprise even himself. It is possible that the time he has spent in giving his subtle encouragement to me has, quite subconsciously, created an episodic piece of writing work which has an intrinsic value all of its own. Over the years, these comments have ranged widely over some of the bigger subjects as well as the small. It’s something I must do. I must carefully collate all these comments, if only in a simply word document, and email it back to Jim. I hadn’t thought to do this before I started writing this post but now I reckon it’s very well worth doing and, indeed, quite important. None of this is intended to put pressure on Jim, to be continuing to come here commenting all the time. If he stopped tomorrow and never came back, I would understand and would still appreciate all the visits he has made and the care he had taken. So thanks for all the time and energy you've given me, Jim. It's always appreciated and never taken for granted. One of these days, I'm going to give all those comments back to you in a wee bundle and you can see then how much of yourself you might have left lurking around here. Very touching, Ken. Your blog rendered Jim speechless (momentarily, I hasten to add). I, too, know the joy of Jim's comments. He's a wonder - loyal and true, honest and erudite. There are a few of us, Ken, who have been privileged to be so honoured. In years to come when we are all dead and gone, some 'future creature', as the Australian writer Gerald Murnane describes, will link us together. 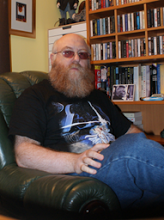 And the poet and writer, Jim Murdoch from Glasgow will be at our centre. This left me speechless. For maybe five minutes. Now I’ve had lunch, watched Click! and had time to gather my thoughts. Everyone needs a pat on the back every now and then and I’m glad it was my turn. I checked the calendar and I’m definitely overdue a pat on the back. Life online can be … well, just plain disappointing much of the time. So it’s nice to know there’s someone out there who appreciates you. I like that you say my writing evokes—and I’m assuming by extension I embody—a more solid time, a time when the term ‘friend’ meant something, was something that had to be earned. The Internet has devalued the word. I have dozens of e-friends (I think that expression should be adopted) who I know next to nothing about and it’s not simply the fact I’ve a lousy memory; they simply haven’t impressed themselves on me. That was not the case with you. I realised very quickly that we were kindred spirits and so when I do talk about ‘my friend, Ken Armstrong’, I mean ‘friend’ in the old-fashioned way, a proper friend, the kind you stick by through thick and thin. There are really only two other people I feel that way about and three good friends is enough for any man. One of the qualities I value highest is duty. It can be a dispassionate word but that doesn’t mean it has to be unfeeling. Once a person becomes my friend I feel a certain duty to maintain that friendship, to work at it. Sometimes it’s remembering a birthday—which I know I am bad at—or it might simply be taking a few minutes to comment on their blog each week. It’s horrible when you post something and no one says anything. So I dutifully comment on a handful of blogs every week even if they’re not always responded to. A response is nice but my participation is not conditional on receiving feedback. A post like this makes up for all that. You should schedule another for maybe 2019. I might be flagging a bit by then. Carrie: :) My work here is done. Elisabeth: Thanks for adding your voice. I do know that Jim 'sees other people'. I'd be worried otherwise. :)I hope Gerald's 'Future Creature' is kind. With you all the way here, Ken. Both my experience and my perception of Jim Murdoch accords exactly with yours. Jim's critical support - its diligence, its understanding of craft and its comprehensive attention to detail - have been invaluable over the years we've known each other. Thanks for beating me to the eulogy! I think it is great that you decided to go ahead and show Jim how valuable his comments are for you. Most of the time, we are afraid (for want of a better word) to show how we truly feel about something. Jim, with his comment on the post, has showed anyone who will be reading only this post the value of his comments indeed. Ken - I remember first seeing Jim's blog about five years ago and there was something that struck me. . . not only was the person behind it quite interesting but he seemed approachable as well. I built up enough nerve one day to send Jim an email about something I'd written, and it was one of the best decisions I'd ever made. Thank you for writing so perfectly that which I'm sure I'd never be able to articulate nearly as well.